In the coming week or two, we will be posting as much preview content as possible. We are continuing today with five freshmen to watch, coming on the heels of five players and five coaches to watch last week. There is still plenty more to come. This whole preview post could have been a tribute to the talents of one Emmanuel Mudiay, who originally committed to hometown SMU but, much to the dismay of SMU and college basketball fans, opted to get paid to play professionally in China. Without his presence, this list lacks the star power evident in other conferences like the ACC and Pac-12. The dearth of top prospects in the AAC is so notable that, according to Rivals, only one of the country’s top 20 and two of the top 75 recruits committed to play for league schools this season. The silver lining, on the other hand, is that there is still very good talent coming into some of these programs, and because so many schools have question marks, many of those freshmen will get an immediate chance to make an impact. The conference’s best freshman may also be its most important, as the Huskies are not only expecting the multi-talented Hamilton to contribute right away, they are expecting him to play an important role in replacing the production of stars Shabazz Napier and DeAndre Daniels. The 6’7″ Hamilton may be the team’s starting small forward from the opening tip and if he can play passable defense and avoid poor decisions, he has more than enough talent to run away with Freshman of the Year honors in the AAC. While 16 teams remain alive in the chase for a championship – including AAC members UConn and Louisville – several other teams are chasing the new coaches that they hope might get them to the Sweet Sixteen some day. USF and Houston have now found their way onto this year’s coaching carousel, and their candidate pools say a lot about where the conference stands and where it’s going. USF fired Stan Heath after the AAC Tournament, and Houston announced Monday that James Dickey had stepped down to deal with a family matter. 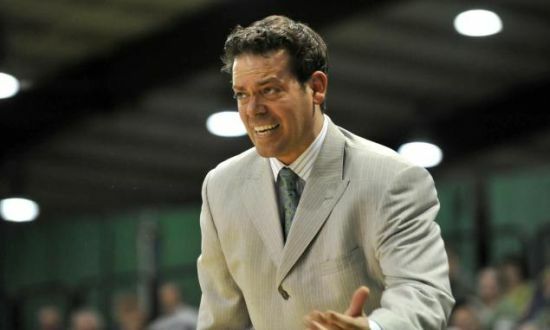 Reports on Tuesday morning indicate that Manhattan head coach Steve Masiello, fresh off a competitive round of 64 loss to Louisville and his mentor, Rick Pitino, has accepted the South Florida position. Another strong candidate has emerged for the other opening in the AAC, Manhattan head coach Steve Masiello, at South Florida. Masiello reached out to mentor Rick Pitino about the job opportunity when it was offered and Pitino told him It’d be a “grand slam.” Pitino said he thought USF was a marginal job in the Big East, but a great job in the AAC. Masiello, 36, led Manhattan to a 60-39 record including an NCAA Tournament appearance this season. Pitino said Masiello is both a great recruiter and an X-and-O’s coach. Stan Heath was fired after compiling a 97-130 mark in seven seasons. Even after sluggish wins in their first two games of the Tournament, Louisville remains one of the favorites to cut down the nets in North Texas. The Cardinals are the third favorite at 5 to 1, behind Florida (7/2) and Michigan State (9/2) to win it all, according to Bovada.LV. Rick Pitino’s squad is the favorite, however, with 11/10 odds, to win the Midwest Region. Connecticut on the other hand is the 13th betting favorite to win it all, tied with San Diego State and is the long shot to win the East Region with 9/2 odds. The site also gives odds to win the Most Outstanding Player of the Final Four and Russ Smith (9/1) is the second betting favorite behind Scottie Wilbekin (7/1). Odds for the winner of the award last year, Luke Hancock, are 18/1. Montrezl Harrell also made the list with 20/1 odds, while Shabazz Napier comes in at 40/1. Louisville Mayor Greg Fischer declared Friday as “Cardinal Red Day” and encouraged everyone to wear red. In 2012, Fischer made a similar declaration before the Kentucky vs. Louisville Final Four game and said the city set a world record for people wearing red in a single day. He hopes to break that record this week. “This is another great time to be a Louisvillian and to show your support for our hometown team,” he said. “I want to paint the town red — literally. Everyone knows that UK fans will be seeing red when the Cards win on Friday.” Fischer encouraged all businesses to display the Cardinals’ colors in their windows and for residents to do the same with their homes. Cincinnati needed more than Sean Kilpatrick throughout the season. In the Bearcats’ NCAA Tournament defeat to Harvard, the Bearcats needed more Kilpatrick. The senior finished with 18 points on just 13 shots, taking only four shots in the second half and going more than 13 minutes without attempting a shot. Unfortunately for Cincinnati, no one else picked up the slack as Kilpatrick was double-teamed and taken out of the game. It was a familiar story in Bearcats losses throughout the year, and nothing changed in the Tournament. Good defense can only take a team so far when it can’t find a way to put the ball in the hoop. For the second time in three NCAA Tournaments, in-state rivals Kentucky and Louisville will square off. This time, the setting will be Indianapolis in a regional semifinal and the match-up was almost inevitable, according to the Louisville Courier Journal. All of the angst from both fan bases about seedings that were too low can be thrown out the window — there are more important things to worry about. The writer says that this rivalry, which will pit the last two national champions against each other, is the best in college basketball right now. Considering the only other option is Duke and North Carolina, and that neither of them have reached the Final Four since Duke’s 2010 national title while one or both of the Commonwealth’s programs have played in the last three, it’s a fair point. This season’s game will be even more passionate and intense than the Final Four battle in 2012. Louisville, at the time making a surprise run to the Final Four, knew it had nothing to lose against the best team in the country. The game was more of a celebration of basketball in the Commonwealth. Not this time. Either team will view the season as a disappointment if its run ends Friday night. Louisville knows that it is in for an intense game on Friday night, but a meeting with No. 1 seed Wichita State may have been a better match-up for the Cardinals because of Kentucky’s size. The Wildcats muscled their way to a 73-66 win in the teams’ first meeting at Rupp Arena in December. Both teams, however, have changed significantly since then. Chane Behanan was still with the Cardinals, although it would prove to be his last game in cardinal red. Luke Hancock is now fully healthy and Chris Jones has adjusted to his role alongside Russ Smith in the backcourt. And although the Harrison twins had a strong game against Louisville in the first meeting, they haven’t played consistently well until the postseason. Shabazz Napier made sure Connecticut wasn’t going to lose on Saturday night against Villanova. The do-everything guard poured in 21 of his 25 points in the second half while battling a shin injury. The senior has seen a lot of things in his four-year career. He was a freshman on the national championship and Big East Tournament championship teams of 2011, and also worked through a 2013 season of no postseason hope for the Huskies. Now he’s got his team back in the Sweet Sixteen, playing in a familiar venue at Madison Square Garden with what should be a strong home crowd on hand. When many of Connecticut’s past greats were no doubt looking ahead to NBA stardom, Napier has played fully for the “UConn” on the front of his jersey. Other than the Louisville-Kentucky game, the best story of the Sweet Sixteen might be the senior guard’s refusal to let his team go home for good. A number of strong potential candidate names have surfaced for the South Florida head coaching job after Stan Heath was fired on Friday. One name at the top of the list is former UCLA coach Ben Howland (also reportedly interested in the Marquette job). Mississippi’s Andy Kennedy has also shown interest as did former Marquette coach Buzz Williams before opting to take the vacancy at Virginia Tech. Athletic Director Mark Harlan said the job has reached a desirable status because of a renovated Sun Dome, a new practice facility and the rising status of the American Athletic Conference. Two freshman big men, John Egbunu and Chris Perry, made the AAC All-Rookie Team, so there’s also some talent waiting in the wings. Even though it might be seen as the most successful Cincinnati team in 10 years, the Bearcats’ postseason finish will be a tough pill to swallow. Still, Mick Cronin said that he’s never had a team achieve their potential more than this group — they gave every ounce they could give. It was the fourth straight trip to the NCAA tournament for Cincinnati and Cronin, but a fifth may prove to be difficult to achieve. The senior core of Sean Kilpatrick, Titus Rubles and Justin Jackson will all depart. No double-figure scorers return, although two starters, Shaquille Thomas and Ge’Lawn Guyn, are expected to. No matter the roster, though, do not count Cronin out of anything. The AAC is at ground zero of the biggest storylines coming out of Selection Sunday. The first is that league regular season co-champion and tournament champion (and defending NCAA Champion) Louisville was rewarded with a #4 seed. Given that they had been discussed as a potential #1 seed, this came as a bit of a surprise. Basically everyone thinks this was a terrible job by the Selection Committee, and ESPN’s Andy Katz went at committee chairman Ron Wellman over the treatment of the Cardinals. Silver lining? They’ll be huge favorites to waltz into the Sweet 16, and probably favored over anyone they would meet there. The other big story was SMU being left out of the field in particular, and the lack of respect the Selection Committee had for the AAC in general. The Mustangs’ resurgence had been one of the biggest stories of the college basketball season, and they had been considered a lock for most of the past month. But in the last few days, and particularly after they lost to Houston in the AAC quarterfinals, their name kept getting mentioned as a possible snub. The committee chairman, Ron Wellman, said SMU was the first team left out. The school held a party at its shiny renovated Moody Coliseum on Sunday to watch the brackets be unveiled, and it turned out to be a pretty pitiful party. “I feel bad for our team and you fans,” Brown told the crowd after the brackets were announced. “I feel like we let you all down.” Silver lining? Everybody on the team should return next year, and Brown is adding the #1 point guard in next year’s freshman class, Emmanuel Mudiay. All of the Selection Sunday drama aside, the real drama starts on Thursday when the ball goes up. Cincinnati is the first AAC team to play, squaring off against Harvard at 2:10 p.m. Thursday on TNT. Then Connecticut plays St. Joseph’s at 6:55 p.m. in Buffalo on TBS. Louisville plays Manhattan in Orlando in the last game Thursday night on TNT. And finally, Memphis tips off against George Washington at 6:55 p.m. Friday in Raleigh on TBS. In non-NCAA postseason news, SMU will host UC Irvine in the first round of the NIT at 9 p.m. Wednesday on ESPN2. Interestingly, they are in a quadrant with Arkansas, a team the Mustangs lost to in the non-conference portion of their season that cost them a NCAA bid. SMU is the only AAC team to make a postseason tournament other than the NCAAs; none were selected for either the CBI or CIT. Obviously, not all of the AAC teams will be playing more games this season. South Florida finished last in the AAC, and on Friday coach Stan Heath was fired. Heath won two games in the 2012 NCAA tournament, but went 6-30 in conference play in the two seasons since. USF’s new AD, Mark Harland, said there has been considerable interest in the job. Among the rumored candidates: Ben Howland, unemployed since he was fired from UCLA last year, and with Harland worked at UCLA; Andy Kennedy, who has had limited success at Ole Miss; and most curiously Buzz Williams, who had a down year at Marquette but has done an exceptional job there. We find it hard to believe Buzz takes any job with Rick Barnes’ hold on Texas so tenuous, but USF should have good options. Well we are finally here. The brackets were released a little over 12 hours ago and by now you have probably analyzed (or overanalyzed your picks). And you have your choice of bracket challenges to enter including the ridiculously hyped Billion Dollar Bracket Challenge from Quicken Loans (it’s not technically a billion if you read the fine print), which has some interesting caveats. If you want a contest free of all of those hassles and you want more glory, join our annual Bracket Nonsense Challenge. We have spent a lot of time talking about the coaching carousel, but players will also start to move on in the next few weeks. Most of the names will be less well-known players transferring, but there are also some very big early entry decisions pending. Perhaps the biggest name to make news on this front is Noah Vonleh, who appears to be leaning toward entering this year’s NBA Draft. Indiana has a decent, but not spectacular incoming class so Vonleh leaving early would be a significant blow to Tom Crean’s ongoing rebuilding efforts. With Vonleh expected to be a top-10 pick in this year’s Draft we have a feeling that he will not be wearing an Indiana jersey for much longer. Speaking of the coaching carousel, three more coaches were fired over the weekend. The biggest move was at USF where Stan Heath was fired despite having four years remaining on his contract. Heath went 97-130 in seven seasons so his dismissal should not be that surprising and although the USF program is far from a powerhouse it does have many things about it–being in the AAC and a major city–that could make it appealing to a high-major assistant looking to take his first coaching job or a mid-major coach looking to move up a level. Tom Herrion was slightly more successful at Marshall (67-67 in four seasons) than Heath was at USF (albeit without a NCAA Tournament appearance), but that was not enough to help him retain his job as the school bought out the last two years of his contract. Herrion’s team went 11-22 this season, but undoubtedly would have been better if their best player from last season (DeAndre Kane) had not transferred and/or their top scorer this season (Elijah Pittman) not been suspended nine games into the season. The final firing of the weekend came from Jacksonville where Cliff Warren was fired after nine seasons. Warren led the Dolphins to five straight winning seasons from 2007-11 before finishing with three consecutive losing seasons. If you want to find out what happens in the aftermath of a coach getting fired, we encourage you to check out Brandon Marcello’s piece on what happened to Tony Barbee and his Auburn players after the coach was fired. One could argue that the decision was not necessarily a surprise, but the timing and speed at which it was made likely caught many of the involved off-guard. We are not sure whether to view the Auburn players’ reaction (or lack thereof) as one of shock or apathy. It will be interesting to see what will happen to all of those coaches who expressed their interest through Charles Barkley, who apparently has become the unofficial go-between for the job. We are literally as far away from Championship Week as we can possibly be, but that doesn’t there was not some news about its future over the weekend. The ACC appears to be on the verge of moving out of Greensboro and could be moving to the Barclays Center in Brooklyn. The two sides are currently negotiating a mutli-year deal that could bring the ACC Tournament to the New York area as soon as 2017. This would fit with the ACC’s goal of expanding its reach up north and could make the New York area the place to be during Championship Week with Madison Square Garden being the other premier venue. As we head into the postseason, RTC AAC Microwriters C.D. Bradley, Will Tucker and Ross Schulz take a look back at the regular season that was in the American through the prism of four key questions. 1. In its inaugural season, the American offered plenty of storylines — notably, the transient nature of its membership and the huge gap between haves and have-nots — but none was bigger than the race for conference POY. Some observers suggest that the conference’s trio of elite guards — Cincinnati’s Sean Kilpatrick, UConn’s Shabazz Napier, and Louisville’s Russ Smith — may be First Team All-Americans. But only one can be AAC POY, so who’ve you got? 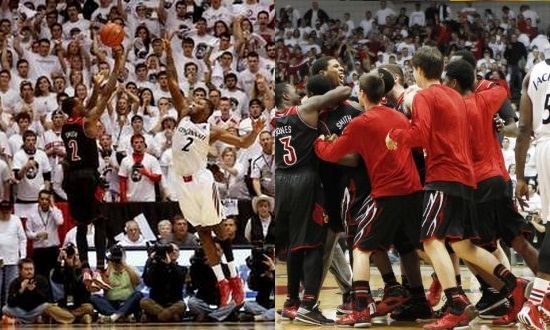 Russ Smith’s game winner at Cincinnati was perhaps the signature moment of the AAC’s first season. Will: It’s really, really close, but looking at their head-to-head matchups, I’d give the nod to Russ Smith. It was my belief that the award was Kilpatrick’s to lose until Russdiculous hit his game winner at Cincinnati in one of the most intimidating environments I’ve seen this season. I think Napier essentially took himself out of the running after shooting 2-of-13 and committing six turnovers during UConn’s dismantling at the hands of Louisville on Saturday. Ross: Sean Kilpatrick. The Cincinnati senior put his team on his back and led them to victory on numerous occasions. It was a tight race, but if you take any of the three contenders off of their respective teams Cincinnati would be the most negatively affected without its star. That fact alone, since they finished in a tie at the top of the standings with Louisville, puts him just barely ahead of Russ Smith. With Cincinnati‘s rout of UCF complete, the focus shifted to the biggest AAC matchup of the weekend: Louisville‘s visit to the Bearcats at noon Saturday on CBS. Cincinnati coach Mick Cronin said it will be much tougher to get a second win over the Cardinals; the Bearcats beat Louisville 69-66 on January 30, and the Cards haven’t lost since. “My belief is that we probably surprised their players a little bit with the kind of team that we have and what we’re capable of and we’re not going to catch them off guard this time,” Cronin said. The game between the top two players in the league standings kicks off a wild 15-day period when all of the AAC contenders have multiple games against teams still in the hunt for a league title. Speaking of Pitino, when anyone does, John Calipari cannot be far behind. Earlier this week, an out-of-context quote from Pitino about social media caused a kerfuffle, and now the UK coach has publicly taken a stance opposed to that of his Louisville counterpart. Shocking, we know. Coach Cal said coaches who hate social media “know nothing about social media,” and that he teaches his players to use social media to build their brands. Eric Crawford weighed in and said both Pitino and Calipari had valid points, which is fair enough, but the more interesting aspect is the inability of these two not to appear at odds at every opportunity. The CBS college basketball crew identified 15 coaches on the hot seat in both blog post and podcast form, and two of them stalk AAC sidelines: James Dickey at Houston and Stan Heath at USF. Both are predicted to be gone at season’s end, and it’s pretty easy to see why. Heath led the Bulls to two tournament wins two years ago, but has gone 6-26 in conference since then. Dickey brought in some nice recruits, but a New Year’s Eve win over UConn is the Cougars’ only victory over a KenPom top 150 team this year. Houston has more talent on hand, and therefore might recover more quickly with the right hire, but both programs are close enough to talent-rich areas to potentially have much more success than they’re enjoying now. SMU’s Larry Brown continues to draw attention to the Mustangs’ renaissance, and by extension himself, with HBO’s Real Sports in Dallas this week to do a piece on SMU for Tuesday’s show. The resurgence of the until recently dormant SMU hoops program was a good enough story to lure show host Bryant Gumbel to Dallas to interview Brown, who was widely considered crazy to take the job less than two years ago. Just as screenwriter William Goldman said of Hollywood, in sports nobody knows anything. Amazingly enough, this year marks 15 seasons since UConn first won a national championship. The Huskies will honor the 1999 champs when they host SMU on Sunday, including current assistant coach Ricky Moore and director of basketball administration Kevin Freeman, both members of the team. Hall of Fame coach Jim Calhoun will return from a vacation to attend the ceremony, and it offers a chance to reflect on his amazing success, building one of the best programs in college basketball from basically nothing in less-than-metropolitan Storrs, Connecticut. If you were still one of the tens of people who felt Louisville was an elite team, it’s official now that they are not elite — even Rick Pitino said so. Pitino cited a lack of shot-blocking and size as the main reasons why the team shouldn’t be — “objectively speaking” — considered elite, but I bet if he was to speak candidly he would have a lot more to say. For the record, folks have been down on the Cardinals as they have struggled more than expected during conference play, but I still believe that when everything shakes out the Cardinals will be the best team in the conference. Obviously Cincinnati is in the driver’s seat, so it may be difficult for Louisville to win the regular season crown, but don’t be surprised if they start to gel down the stretch, run through the conference tournament, and are one of the scarier four seeds in the NCAA Tournament. While some teams like Connecticut have not been subtle about their desire the leave the AAC for greener pastures, the conference has one person in their corner at least in Cincinnati coach Mick Cronin. He explained that he was happy to be in the conference for two major reasons. The conference has true round-robin play, which is a departure from the home-and-home schedule of the Big East, and also the competition has helped the Bearcats climb into the Top 20 in RPI. I admittedly didn’t think it was possible for coaches at bigger schools like Cincinnati and Connecticut to talk about loving the AAC with a straight face, but give Cronin credit, those two reasons make a lot of sense, especially considering how bad the team’s non-conference schedule was. The sun has already set on South Florida‘s season but last night’s embarrassment against UConn should be coach Stan Heath firmly in the hot seat. The Bulls have not been competitive this season but Heath did take the program back to the NCAA Tournament not long ago. But his strategy of loading up on junior college players and transfers has helped the program stay afloat but they haven’t made a lot of sustainable forward progress. The 83-40 beat down delivered by the Huskies wasn’t pretty and by the second half, Connecticut players were treating the game more like a scrimmage than a conference game. Heath joked that he may burn the game tape but he may want to actually consider it, because I doubt he will get a lot of teachable moments out of the thrashing. If the Bulls tank badly down the stretch and start getting blown out in embarrassing fashion, there will be a lot of South Florida fans vocally asking for a change in leadership. With Rutgers set to leave for the Big Ten at the end of this season, it was only a matter of time before the AAC and the school agreed on the terms of the exit. Rutgers will end up paying an $11.5 million exit fee, a bit less than the $15 million the conference initially sought. Since the conference has already received $5 million, Rutgers will pay the remaining $6.5 million over a four-year period. There’s not really a lot of deep analysis to be done here. The conference gets paid and gets to save some face and Rutgers couldn’t care less because as of next season they will be making it rain with football dollars. The news is a bit bittersweet as we were just getting to know Eddie Jordan and his rebuilding project would be an interesting one to watch in the next few years. In today’s tidbit that matters not at all, Dallas Cowboys coach Jason Garrett stopped by SMU practice today to say hello to his new friend Larry Brown and see if Brown had any good ideas on how to stop the forward pass. The quotes from both parties are so boring that I will spare you the injustice of having to read them although Garrett did mention something about taking a lot of mental notes while watching Brown coach. So maybe instead of reading cliches, you can imagine Jason Garrett watching Brown run the three-man weave with his brow furrowed, trying really hard to take good mental notes. Rutgers junior Myles Mack is finally embracing the point guard role that Eddie Jordan wants him to play, according to Brendan Prunty of the Newark Star-Ledger. The 5’9″ guard has been tasked with transforming his game this season, making the adjustment from playing off the ball under former coach Mike Rice to becoming the primary distributor and decision-maker in Eddie Jordan’s system. He may have turned the corner last Saturday during a 93-70 win against Houston, turning in a “near-complete performance” that included 25 points, six assists and just one turnover. “I tell our team, ‘You’re the first building blocks of a new regime. A new program,’ Jordan said. “We’re rebuilding. So yeah, there’s going to be some uncomfortable times out there, but we think it’s going to be best for the long run.” Jordan stressed that making the move to the one-guard spot would also improve Mack’s chances of a successful basketball career after college. People might have to start taking the AAC more seriously after the conference placed a season-high four teams in the Associated Press Top 25 yesterday. Cincinnati (#7), Louisville (#14), UConn (#22), and Memphis (#24), all made the cut for the American, which was surpassed only by the Big 12 and its five teams in the poll. SMU also received votes after its big win over Memphis. Over in the Coaches’ Poll, the league was actually the only one in the country with two teams represented in the top 10. The bottom half continues to look pretty bleak, and KenPom only ranks the AAC seventh among all conferences, but the AAC has quietly upgraded itself from what momentarily looked like a three-bid league to one likely to claim five. Yesterday’s AP poll was historic for Cincinnati too, as the Bearcats earned their highest ranking in the Mick Cronin era. Not since 2003-04 under Bob Huggins have they come so close to the Top 25 summit. Incidentally, that same year Cincinnati went 3-1 against Memphis and Louisville on its way to a Conference USA championship, a model it will try to replicate this season. “We’re not done yet,” senior Justin Jackson said after his team beat USF to move to 10-0 in league play, adding that the goal now is to secure a high seed in the NCAA Tournament. Cronin echoed those comments, reflecting, “We understand the importance of seeding in the NCAA tournament. The last three years, we’ve had terrible draws.” The Bearcats are certainly on pace to earn a much more favorable situation this season, with Jerry Palm now projecting them as a two-seed in the East Region. A 50-45 loss at Cincinnati last Sunday has left Joey Knight of the Tampa Bay Times wondering what could have been were USF not the second-worst three-point shooting team in country. The Bulls bested the Bearcats in several statistical categories, including a defensive rebounding advantage, and held the league leader to 33 percent shooting and its lowest scoring total in AAC play. But despite connecting on 47 percent of their shots inside the arc, USF made only 1-of-9 threes, and missed all five of their attempts in the closing minutes of the game. That fact isn’t lost on Stan Heath, who admitted that opponents would continue to run compact zone defenses against his team until forced to respect the Bulls’ outside shooting. “Down the stretch if we had been a little bit better against the zone, come up with some of those loose balls, it’s our game,” he said. UConn forward DeAndre Daniels returned to limited practice yesterday after sustaining a high ankle sprain on January 25 against Rutgers, and is expected to test his ankle further in practices today and tomorrow. His team’s chances of winning at Cincinnati on Thursday greatly improve if Daniels is on the floor, and senior Shabazz Napier described his return as “super important. DeAndre is our X-factor.” Prior to his injury, the 6’9” junior bookended a dud against Louisville with huge double-doubles against Memphis and Temple, including a 31-point, 12-rebound performance versus the Owls. Daniels’ production seemed to be catching up with his talent this season, and his status on Thursday could have a big impact on UConn’s hopes of remaining within striking distance in the AAC race.